Arrive in any coastal town in Australia, especially one with a working harbour, and there is an excellent chance that you will see the bird with the longest beak in the world; the Australian Pelican. This common pelican is known to breed in huge numbers on inland water bodies, but is most readily seen as an incidental spotting around coastal harbours and city park lakes. At around 10 kg, it is by no means the largest of the pelican family, but for those of us who are not used to seeing this species, it is a prodigious bird! 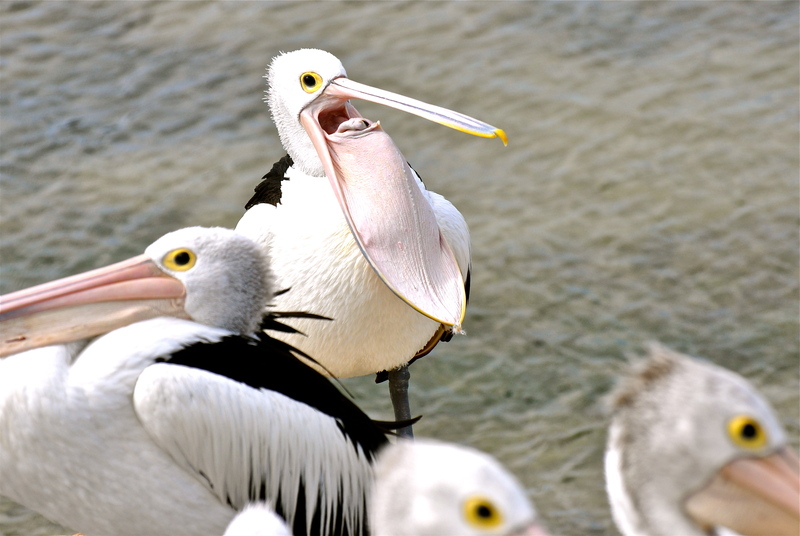 Despite its name, the Australian pelican can be found from the western islands of Indonesia, through Papua New Guinea, taking in all of Australia and beyond, to New Zealand and the Pacific Islands. They have been recorded flying at altitudes of 3000 meters, staying in the air for 24 hours without a break. There are records of individuals surviving for up to 25 years. I took these photographs on Kangaroo Island, in South Australia in the small port town of Kingscote. A knowledgeable, but somewhat grumpy retired local fisherman turns a buck or two by feeding pelicans at Kingscote Wharf. This is the kind of spectacle that I normally avoid, but in this case I can definitely recommend a visit. There isn’t a huge amount to do in central Kingscote, so taking some time to watch the mass of pelicans arrive, with my family was a fascinating and highly educational way to pass an hour. The show takes place at 4.50 every afternoon but there are always pelicans in the area. These birds normally hunt by plunge diving, often in groups. The sight of pelicans graceful riding the thermals, as they circle high in the sky above Kingscote, is in stark contrast to the argumentative pod of smelly, chattering creatures, waddling on top of one another in a fight for the last of the fish scraps. The fisherman holds a scrap of eel in the air and the pelicans fix bayonets pointed skywards, gathered around his waist like a heaving black and white Hula skirt. When the feeding frenzy is over, these magnificent flying machines take to the air again, where they circle in large squadrons as the setting sun, lights the sky with a fiery orange glow. If your time in Australia is limited to a short visit to Sydney, then Centennial Park duck ponds is a beautifully green place to start looking for your first pelican. If you can’t spare the time, head to the Sydney Fish Market in Pyrmont. There is always a hopeful pelican hanging around, waiting for a few scraps, and you might treat yourself to some of their exceptional cuts of the freshest fish while you are there. I’m in the process of planning a trip to Sanibel, Florida where I hope to get my next pelican experience. 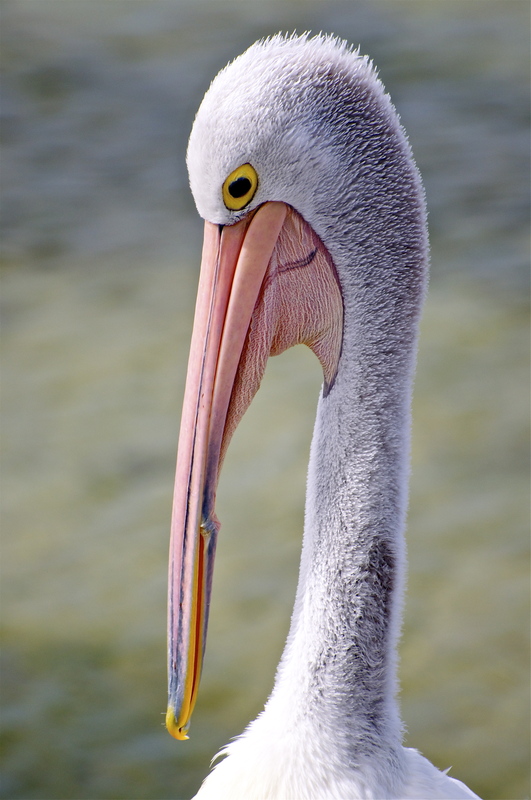 Do you have any recommendations for pelican watching in Florida or the US? Fairywrens at the bottom of the garden? I guess the first thing I thought of when I saw the first photo was not the beak but the wingspan, wow. Thanks for the comment! They are certainly impressive birds. They’re impressive, that’s for sure – as you mention ‘ magnificent flying machines’. I think pterodactyl when they come zooming overhead. What a dramatic effect those plunge dives are. I once watched a gaggle of juvenile grey pelicans scrumming in the water after an aerosol bottle, using it as a ‘toy’ tossing it up into the air, play diving and tussling until the next got it up into the air again. Enjoyed your post, particularly the close-up details. Brown pelicans are a daily occurrence on our coast of NC. Flying over the beaches in formation, we call them our local “air force”. It’s a wonder that they survive the mighty plunges into the creeks and sounds for fish. The local fish houses usually have a couple who come to beg for scraps and pose for photos. I’m really glad I found your blog. Looking forward to reading about more of your adventures. We just got back from a visit to the northernmost Outer Banks of NC. Great for seeing nesting ospreys, pelicans and the Corolla wild horses, descendants of the Spanish mustangs.